In 1762 the philosopher Jean-Jacques Rousseau observed that we are blind half our lives because of what we miss during the night. Yet we fear the dark, and are led to believe that bad things happen during the small hours, especially in cities. This is when insomniacs, psychopaths and photophobics—those who are afraid of the light—roam the streets; the time when “normal” people should be tucked up in their beds. The Elizabethan playwright Thomas Middleton wrote that there should be “no occupation but sleepe, feed, and fart” during night-time hours. Yet there have long been literary walkers, flâneurs, who have wandered the dark streets of their cities to uncover the secrets of the night: from Restif de la Bretonne, in his 1789 Les Nuits de Paris, labelled both eccentric and pornographic—to Charles Dickens, who in his Night Walks (1861) evoked the sleeplessness of “a man who defied the night, with all its sorrowful thoughts”. As cities became lighter, through the advance of technology and commerce, the writer’s fascination in the mystery of the night-time city faded. But some cities, restless metropolises like New York and London, retain their nocturnal allure. Madrid is one such city. In 2016 writer Ben Stubbs was drawn to explore the Spanish capital at night like the flâneurs of the past. He set out when the sun went down to examine the life of the night in this often-maligned city, a place famed for its late hours and exuberant nightlife. Exploring the history of everything from tapas to the new politics of Podemos, he encountered the city’s cultural quirks and clandestine stories while talking to many Madrileños who are normally denied a voice in the city. 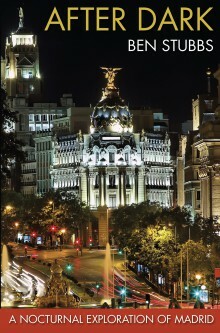 As each hour of the night unfolds, Stubbs discovers different layers within Madrid that many visitors do not see as they stick to well-trodden guidebook itineraries. The deepening darkness reveals cross-dressing migrants, people who live at the airport, Muslims celebrating Ramadan, hotel workers hidden in the bowels of the Ritz, all-night taxi drivers, party-goers enjoying their nightly marcha from bar to bar, poodle-blessing priests and locals in the poorer barrios who walk the streets with him to share the experience of a trasnochador—one who lives during the hours of the night. Mixing personal observation with literary and historical references, Stubbs introduces us to a hitherto unknown and fascinating dimension of Madrid. After Dark reveals a multifaceted city, full of surprises and possibilities, and very much awake and alive between dusk and dawn. Ben Stubbs is a travel writer and academic based in Adelaide, Australia. He is a regular contributor to literary journals and newspapers in Australia and overseas.